The visit; I have been before but only into the ground floor and that is vast, to me – this is a Cathedral of Whisky with many stained glass bottles. Today is my first full visit, a whole new experience opened up. I must say it is sometimes hard to book a tour here, with that and the fact that you cannee go to the bar without a full tour ticket, they missed the boat there I feel. How much money/whisky have they lost by this? Once in, it is mega! A huge complex well laid out, the still room is huge and is spectacular with many innovative presentations and ideas, from the coopers room to the dark cask room, impressive. 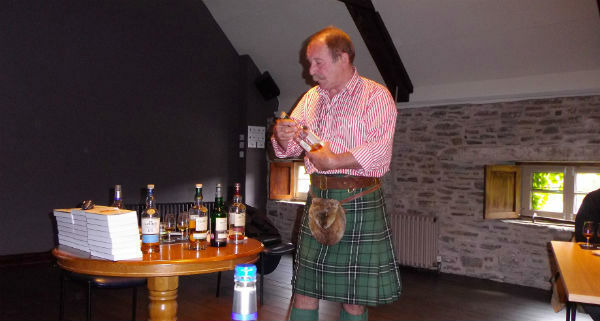 For whisky beginners this tour is a must, I would recommend this tour to anyone, go and see it and think about it later. I was sceptical, so many comments and stories kicking about, I just had to make my own mind up. I loved the still room – all 3 sets. The visitor will definitely come out with more whisky knowledge and a glass. The purists may not like it, but guys, you know who you are, just try it before you bin it. Macallan’s £140m distillery, is producing spirit for the Macallan single malt brand after the original adjacent site was decommissioned in October 2017. With 36 copper pot stills – 15 more than the previous site – the new distillery will enable production of the Macallan single malt to increase by up to one-third if required. Stills are arranged in 3 circular ‘pods’, with 21 stainless steel fermenters, a 17-tonne mash tun, said to be the largest in Scotland. The distillery & visitor centre has been inspired by traditional Scottish brochs, or roundhouses. Its’ undulating grass and wildflower-topped roof – one of the most complex timber roof structures in the world – has been designed to blend into the surrounding Speyside landscape classified as an ‘Area of Great Landscape Value’ or, Telly Tubbie land. 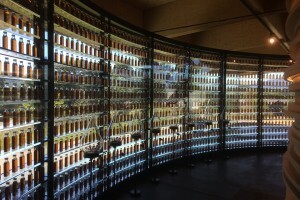 The visitor centre houses the Macallan archive – 398 bottles, 19 decanters & four flasks on public display for the first time. The original distillery, first licensed to distil in 1824, has been extended many times in the last 200 years and will be mothballed for the foreseeable future, me? Unsure why? Macallan’s bar will include 952 bottles for whisky connoisseurs to try eventually, including Macallan’s iconic No. 6 and M, as well as The Genesis Decanter and The Genesis Limited Edition, a bottle made specifically to commemorate the new Macallan Distillery and Visitor Experience. Only 600 of the decanters will be made, each priced at a staggering $60,000. I left mine there! FACTS: The roof comprises 1,750 glued laminated timber beams, making up a 3x3m grid that carries 2,500 cassettes supporting the natural meadow (tubby) roof covering. In total, there are over 380,000 individual roof components. The timber elements were manufactured in Austria. There were over 5,000 lifts, using 4 mobile cranes, to install the roof structure. The project used 20,000m3 of concrete. 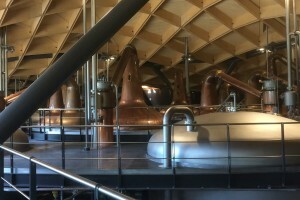 The steelwork comprises 700 tonnes of beams supporting the distillery’s unique roof. The beams are secured to the concrete frame at structural support nodes, where two circular hollow sections come together with a large division plate running through the middle and a baseplate at the bottom. The steel has been welded by specialist craftsmen who pride themselves on quality of detailing, meaning that the full structure remains a visible feature within the interior of the distillery. Did I enjoy my tour? Apart from not being able to have the drams (I was driving again) and Macallan do NOT have wee bottles or tubes for driver drams, disappointing. But on the whole, aye it was good, informative, interesting, very different.